We really enjoy cooperative board games for families, so we were pretty excited to do this Castle Panic board game review. Was is good enough to make it onto our list of best co-op games for kids? Read on to find out! 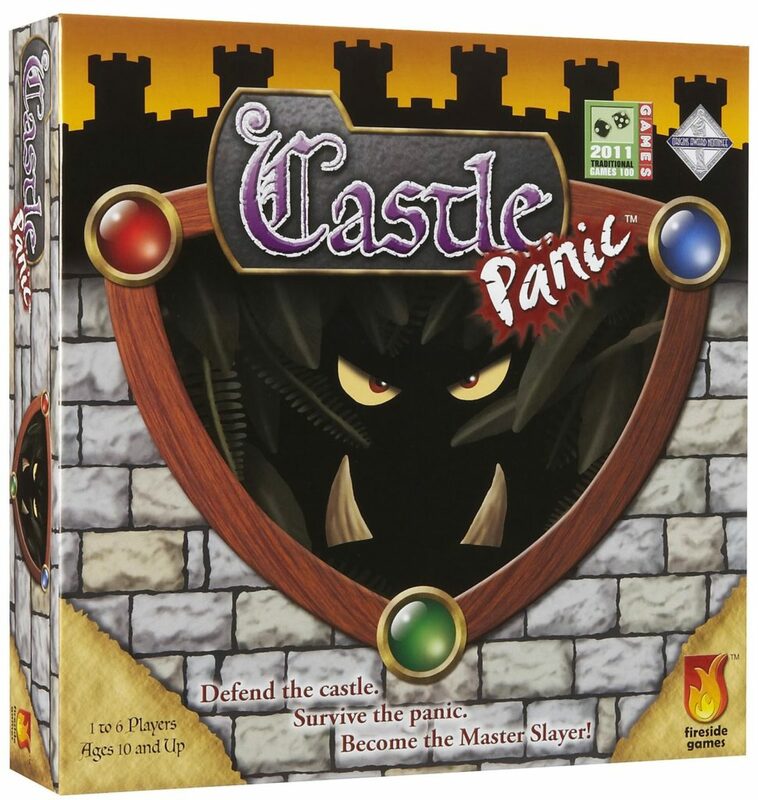 Castle Panic is a cooperative castle defense game created by Justin De Witt and published by Fireside Games. You and your fellow players have just finished building your castle in the woods, surrounded by fire, water and forest. 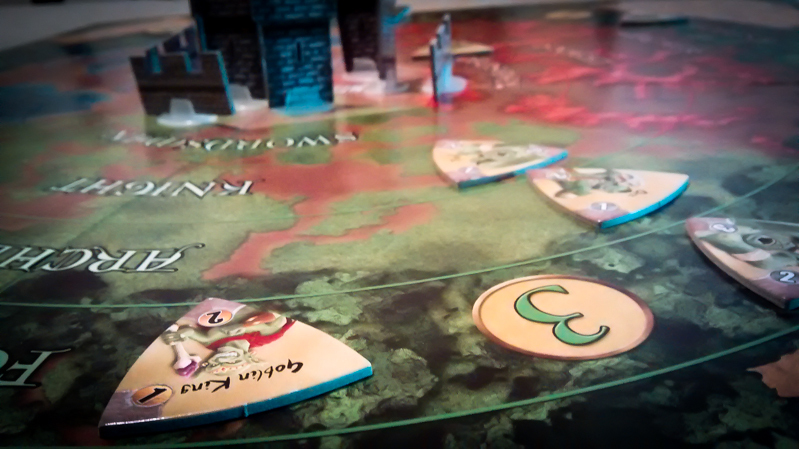 Once you have completed your castle, goblins, trolls and orcs begin attacking. The goal of Castle Panic: Defend the castle from the bad guys and save as much of the castle as possible! The area around your castle is divided into three arcs. The arcs each have three zones that can be targeted by your archers, knights or swordsmen. 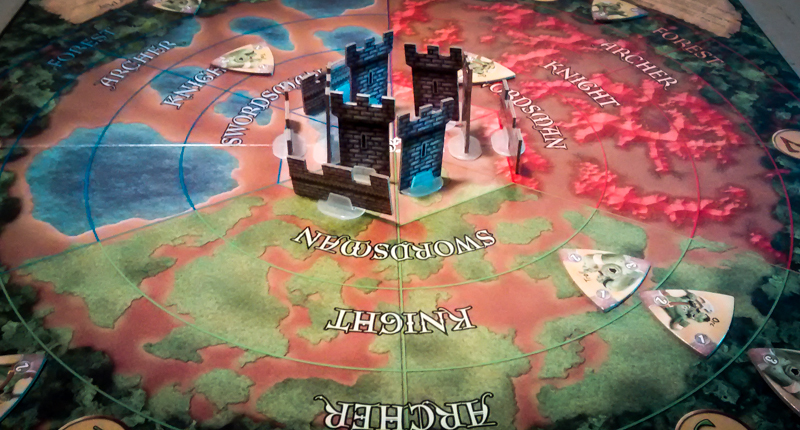 Each turn, the active player chooses which areas to defend. The players must draw and trade cards in order to make sure that the active player has the resources that they need to defend the tower. At the end of each player’s turn, the monsters on the board will get closer and two new monsters will show up. The common monsters take 1-3 hits to destroy. There are also some special monsters that make the game quite a bit tougher. When you’re drawing new monsters, you could end up drawing one of the special effect tokens, which alter the board state in one way or the other. If the monsters are able to get through the walls and completely destroy the castle, all of the players lose. If the players are able to work together to take down all of the monsters, then everyone wins! At its core, Castle Panic is a tower defense game. There is a certain amount of fantasy and combat, but its real focus is on defense and working together against the oncoming monsters. Cooperation is a really big part of the theme in Castle Panic, which also helps to bring the theme to life. You really do feel like you have to help each other to have a chance to fend off all of the monsters. Castle Panic is a wonderful coop board game with its emphasis on that aspect. There is no way to play only for yourself or you will have a very low chance of winning. It does a really great job of creating a truly cooperative set of mechanics. They have included one method of play where any time a player kills a monster, they keep the monster’s token. This allows the players to name a Master Slayer at the end of the game, and provides the chance for some competition and a kind of “winner” at the end of a cooperative game. Some players will think that this could be a bad thing in a co-op board game, but others will like having the option. We also really appreciated how clearly the Castle Panic rules are laid out in the rulebook. It is a great gateway game and a very easy game to teach. Players who are interested in deeper games or high levels of combat will probably not be very interested in Castle Panic. Our group is usually four or five adults, so this one won’t hit the table too often. However, if we have the kids with us, this is an excellent choice. If you like castle defense and are looking for a great cooperative board game for the family, you will probably get a kick out of Castle Panic. It has a very straightforward design, so it is a great pick for families who want an entertaining cooperative experience. It didn’t quite make it onto our list of top cooperative board games for kids, but it is one of our favorite family games! Thanks for taking the time to read our Castle Panic board game review!